When I started playing basketball in grade school, I taught myself how to shoot. 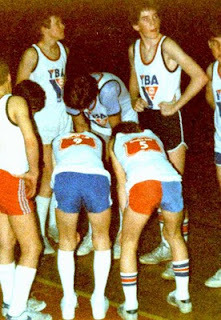 Because I was taller than most kids, I used my height to my advantage and protected the ball by shooting it from behind my head with both hands. Shooting like that worked in grade school, but I had developed the bad habit of shooting with bad form and by the time I got to Jr. High, my coach made me start from scratch and learn how to shoot with correct form. I thought I'd include a picture of me from that time. I'm the tall lurpy one. You gotta love the early 80's styles. Check out the sweet shorts, the long tube socks, and the arms. You probably didn't realize you'd have tickets to the gun show when you started reading this post. We all have our bad habits. Some of these might include overeating, skipping breakfast, lifting weights with poor form, not warming up or cooling down, bad posture, or distracted driving. Some of those habits mentioned don't seem like much, but little things add up over time and become bigger problems. Just ask anyone who's had a root canal. Good health habits include regular flossing, wearing seat belts, exercising on a regular basis, getting enough sleep, wearing sunscreen, drinking enough water, etc. These might sound monotonous and insignificant, but healthy habits are at the foundation of a healthy lifestyle. This topic reminds me of a quote I like. "Sow a thought and you reap an action; sow an action and you reap a habit; sow a habit and you reap a character; sow a character and you reap a destiny." This quote and variations of it have been credited to Ralph Waldo Emerson, James Allen, and a host of other people so I'm not sure who to credit for it, but I believe that small and simple habits do make a big difference over time and can affect our destiny. So, how does one go about creating new habits? Repetition is the key. Developing some habits may only take days, while others may require years of repetition and practice. If you analyze your long term goals, you can break them down to into smaller steps and decide what habits would help you to accomplish those goals. Some people focus on overcoming bad habits that are slowing them down or overcoming addictions they want to get rid of. Others choose to focus on positive habits they'd like to develop. The most important thing is to pick something that is important to you that you'd like to change and work on it enough until it becomes second nature. PS- My shot is sweet as silk today. Thanx for that. I have alot of behaviors that need changing. They mainly stem from psychological issues I have. I started addressing them last night. Nice post, habits can be good and bad we all have them .. some say it takes 28 days to break a habit or form a new one! In Zen, good or bad habits are actually the worse thing to have cause there is no mindful awareness in a habit. If you could avoid habits all together and be mindful each and every time then that makes a real change but for us mere humans thats easier said than done! Bad habits are certainly challenging to break. I like your idea of repetition though. Pretty simple but if you force yourself to exercise on a set schedule and eat well, it becomes second nature.